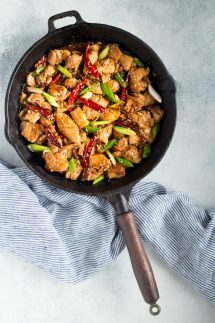 Low Carb General Tso's Chicken - Keto Friendly weeknight dinner! 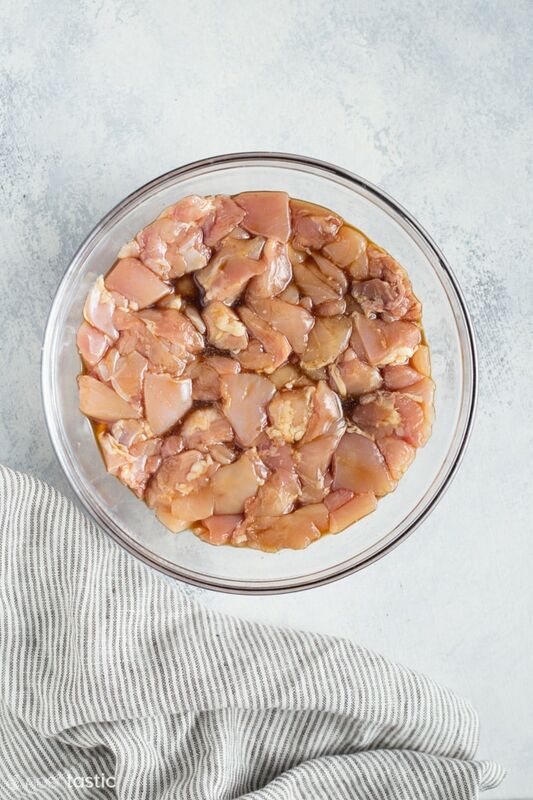 Low Carb General Tso’s Chicken is a keto friendly remake of this American Chinese classic, all the taste you love but without the added sugar and carbs. This recipe comes in at around 4g net carbs per serving, which makes it perfect for dinner! While you could use chicken breast for this recipe if you must, it will taste a whole lot better with chicken thighs. Despite the number of dried chilis used, this is not a really hot dish. The chilis add just a touch of heat, and of course you don’t eat them. However, not all chilis have the same amount of heat so just be sure to check before you use them what sort of chili it is. Don’t skip the marinating time, it doesn’t take long but it will help to add flavor to the finished recipe. In order to keep this recipe low carb and keto we are not thickening the sauce, instead we are reducing the liquid. Just make sure that you take enough time to complete this step. Is General Tso’s Chicken Spicy? Although there are quite a few dried chilis in this recipe I did not find it spicy and my children ate it without complaint. There is of course some flavor from the chilis, which is why we added them, but it’s not hot. Just ensure that you are not buying a really hot variety of dried red chili and you should be just fine. Why is it called General Tso’s Chicken? 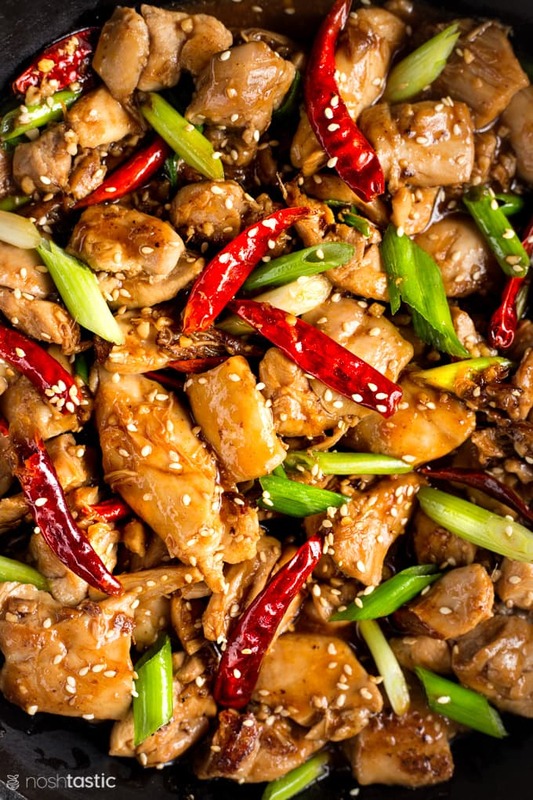 General Tso’s Chicken as it’s commonly made and eaten in the USA is not known in China. Apparently the dish was created by Chef C.K. Peng (or Peng Chang-kuei) in Taiwan during the 1950s. In the 1970’s the same chef brought the dish over to New York City and served it to Henry Kissinger who was fan. 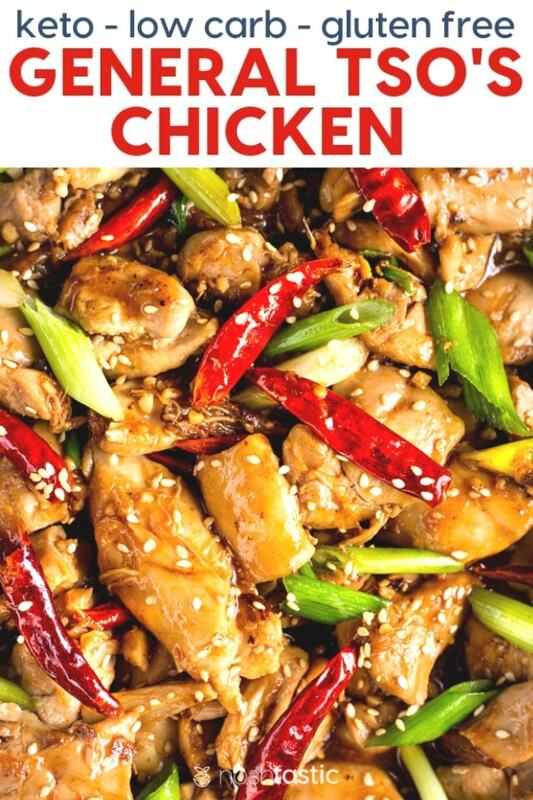 There is a Chinese version but the actual recipe is not at all similar as it’s not deep fried and doesn’t contain lots of sugar, so perhaps our low carb General Tso’s Chicken is more authentic after all! Pin This Recipe To Your Low Carb Board! An easy to cook low carb keto friendly General Tso's Chicken that's a perfect weeknight meal. Mix all the marinade ingredients together and add the cut up chicken thighs and marinate for 30 minutes. Stir fry the chicken using a little oil over a medium high heat for 3-5 minutes, then remove it from the pan and set aside. Add all the General Tso's Chicken Sauce ingredients to the wok or cast iron skillet and reduce it over a medium heat for about 10 minutes. Add the chilis in the last three minutes. Serve hot with a sprinkle of toasted sesame seeds. Don't forget to join our Keto Low Carb Facebook Group! Sounds wonderful. I want to make, today. What can I use to replace the dry Sherry? I’d just increase the soy sauce and rice wine vinegar a little bit, I can’t think of a similar substitute.